Hugged by evergreens and with a great view of the tower, the Hickory Hill Chapel is a charming spot for a medium-sized gathering or wedding. 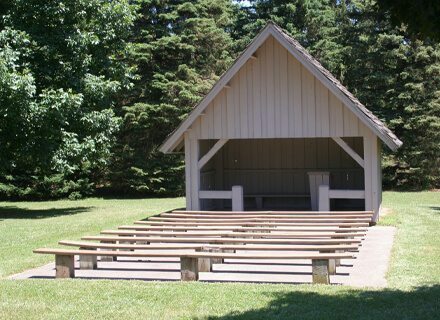 The three-sided structure is located in the lower athletic field and includes wooden benches in an amphitheater style arrangement. From the gatehouse, take the first right. When you reach the athletic field, go left at the fork at park at the lot next to the tower. The chapel is adjacent to parking in the athletic field.